Urban Hardwoods of Seattle, WA, is an impressive and growing concern that illustrates the potential of taking the urban wood movement to dazzling new heights. Urban Hardwoods mills urban trees into lumber and processes it into beautiful furniture. What’s more, the company has showrooms in Seattle, San Francisco and soon at the Pacific Design Center in Los Angeles. Check out this video to gain a better appreciation of this trendsetting company. Urban Lumber Company has been giving a large quantity and wide variety of felled and fallen trees in and around Kansas City a second chance since 2005. As of October 2016, Urban Lumber Company’s website claims it has recycled a total of 638,062 pounds of wood and sawn 90,886 board feet. As owner Tim O’Neill told the Kansas City Star in an article published April 8, “There’s a unique and wild look to this lumber, particularly in the variety of species found around town.” Woods cited in the articled include ash, elm, hickory, locust, maple, mulberry, oak, pecan, sweet gum, sycamore, tree of heaven and walnut. O’Neill, a former exhibition designer, was inspired to found Urban Wood Lumber after having a hackberry tree downed by an ice storm sawed into logs. “I’d been spending lots of money on lumber, and all of a sudden I had a large pile. It was super cheap and easy to find, since dead trees are everywhere. It was interesting to work with, too,” he told the Star. O’Neill processes logs on a TimberKing sawmill and also invested in a dry kiln. Customers include local custom woodworkers, homeowners and woodworking hobbyists. Visit Urban Lumber Company’s website. IllinoisUrbanWood.org blew past 15,000 page views for this calendar year in October. As of today, the website has 15,603 total views — more than double the number recorded for all of 2015 and seven-fold the clicks totaled in 2014 when the website was launched. > Giving search engines more opportunities to “recommend” the site by posting 60 articles and videos through October, 60% more than posted all of last year. In October I noted that IllinoisUrbanWood.org ranked number one in Google search for the terms Urban Lumber, Urban Wood Utilization and Urban Wood Sawmills. IL WUT ranked number three for Urban Wood and ranked eight, nine and 10 for Urban Wood Products. > The increased content posts have fed the monthly Illinois Urban Wood Update, a monthly newsletter that debuted in July 2015. It is the monthly newspaper that brings the latest headlines to subscribers. > That subscription database has climbed dramatically from 351 at the end of 2015 to 803 by the end of September 30, 2016, a robust 129% increase. It’s been truly gratifying to see the interest in IL WUT’s online activities swell. 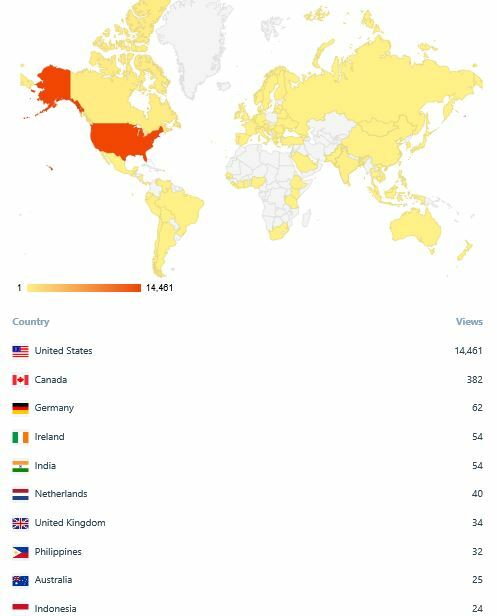 I also find it interesting that while U.S. and Canadian page views represent 92.7% and 2.4% of this year’s total respectively, visitors have entered the website from 83 other countries. Beyond the Top 10 countries summarized in the accompanying graphic are many nations that one would not suspect would have much interest in the urban wood movement, places like Saudi Arabia, Kuwait, Cambodia and the Cayman Islands to name a few. I imagine visitors from some of these far off lands arrived by accident but I’d like to think that many were led our way by the will to learn more about urban wood and urban forestry. Even if it’s a stretch, I can still hope that all left a little more gratified and educated than when they landed. Note: For those interested, here’s a link to my Illinois Wood Utilization Team update PowerPoint for the WERC Webcast.